Note: – The Applicants have to produce an affidavit duly attested by 1st Class Magistrate to the effect that they will not claim for extension beyond the hiring of 03 months/regularization respectively. 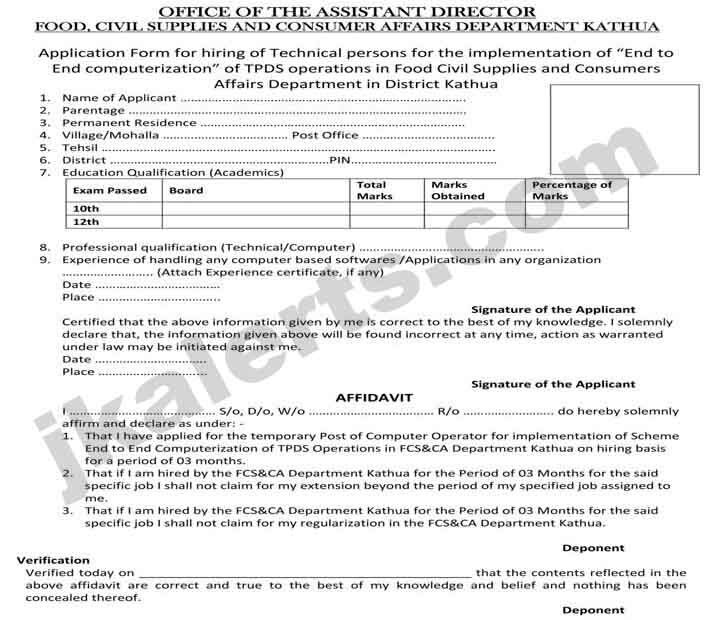 The Application forms shall reach in the office of Assistant Director FCS&CA Kathua within Ten (1o) days from the date of publication of this notice. No Application shall be entertained after the due date. Candidate must be a permanent resident of J&K State. Candidate applying for the hiring must be resident of the same District. Candidate should not be less than 18 years and not more than 40 years of age as on 01/01/2018. The monthly hiring charges / remuneration to be paid shall be Rs. 10000/- (Ten Thousand Only). The applicant should submit their forms along with all the relevant documents Viz. 1. PRC 2. DOB certificate 3. 12th Marks certificate 4. Diploma / Degree certificate 5. Affidavit from 1″ class Magistrate the candidate will not claim for extension beyond the period of hiring of 3 month or regularization. 60 points shall be for academic qualification (20 for 10th& 40 for 12th. The Higher qualification shall not be considered while framing the merit. 20 points shall be for 01-year Computer Diploma/Degree in Computer Application. 20 points for interview/viva voce/type test. The candidates shall be shortlisted for viva voce on the basis of merit obtained in Academics /Technical qualification on prorate basis. The number of candidate shortlisted shall be five times the number of technical hands/persons to be hired. Note: – The Application Forms can be had from Assistant Director Office Kathua on working day.